Vaclav and Lena are both the children of Russian immigrants, as well as being best friends. Vaclav and his parents are the closest thing Lena has to family; although she lives with her aunt, she barely meets Lena’s basic needs, let alone any of her emotional ones. Vaclav, though, has promised her that one day they will be married, no matter what. For now, she is the beautiful assistant in his magic act – until, at least, the day before their big performance at Coney Island. That day, Lena doesn’t show up at school, nor at Vaclav’s house in the afternoon. When she even fails to meet him at Coney Island, Vaclav knows that something is terribly wrong and, indeed, she will be completely out of his life for the next 7 years, when they are 17. Vaclav & Lena is, in the beginning, somewhat underwhelming. Vaclav and Lena have a cute relationship and Vaclav’s passion for magic is endearing, but for the first 50 pages nothing is moving the story along. Once Vaclav and Lena have been separated, though, Tanner’s story really takes off. 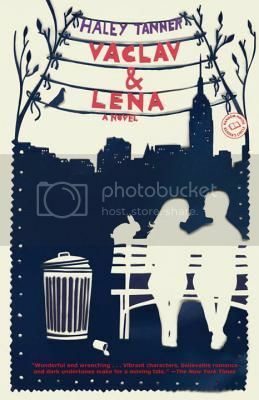 Vaclav and Lena each becomes their own, more fully-developed person, without ever forgetting what it was that held them together all those years ago. By the end, Tanner has created a beautiful and very moving story of a love encompassing both friendship and romance. Although it starts slowly, Vaclav & Lena ends brilliantly. Recommended. Thanks for this review. People were saying this book was so awesome and I was bored. I guess I should have gave it a bit longer. I will try again! Did you give up when they were still young? I was bored then too. And then I read the last 2/3 of the book in one sitting! As far as I can tell, most people have found the beginning really slow, but apparently it picks up nicely as you said. I really like the cover too.